The category temperature protection includes irreversible temperature protection, PTC thermistors, temperature switches with self-hold, automatic or manual reset. The area of application of these components Is from -45°C to +425°C. The temperature controllers from Alpha Therm include small and cost-effective bimetal controllers with up to 2 million switching cycles as well as a wide range of electronic temperature & humidity controllers. The temperature sensor category includes NTC and PTC thermistors as well as platinum measuring resistors (Pt100, Pt1000) and temperature sensors made of these components. These high-precision components change their resistance value with increasing or decreasing temperature and can be used depending on the type from -200°C to + 850°C. resettable fuses, called Polymer PTCs or PPTCs, are under the category of overload protection. Suppressor diodes, metal oxide varistors and gas arresters are among the components that Alpha Therm offers for reliable overvoltage protection. Functionality and reliability are combined in Alpha Therm's wide range of mechanical switches and buttons. With customized design and high quality standards, these cost-effective components convince. 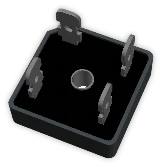 Alpha Therm carries the category Rectifiers, Bridge Rectifiers for 1- or 3-Phase, Rectifier Diodes, Midpoint Rectifiers & Automotive Rectifier Diodes in most common designs.